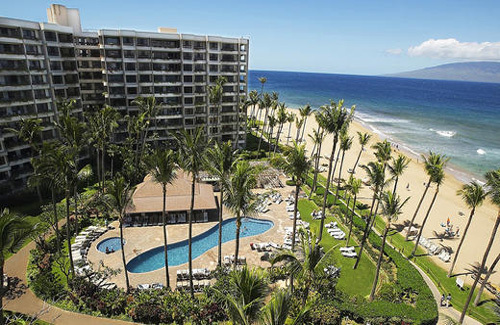 The Kaanapali Alii luxury condo property is located within Kaanapali Resort, just a three-minute walk from Whalers Village and a five-minute walk from Kaanapali Golf Courses. A large outdoor pavilion and patio area with beachside barbecue grills and tables are available for picnics. Guests can also use a fitness room, freeform outdoor pool, children’s pool, and spa tub. It’s a VIP experience on Maui, Hawaii. The seasonal Alii Kid’s Club at Kaanapali Alii provides supervised programs and special offers throughout the Kaanapali Resort available only to Alii Kid’s Club participants. Yoga classes are available to hotel guests every Monday, Wednesday, and Friday (surcharge). Three lighted tennis courts are on site, and guests have select privileges at the Kaanapali Golf Courses, located within a five-minute walk of the hotel. Self parking is complimentary on the condo grounds. Valet parking is also available at this luxury Maui property offering luxury, oceanfront condominiums. The Maui property is close to numerous shopping, fine dining restaurants, outdoor recreational activities. Kaanapali Alii offers four, 11-story, oceanfront towers that house 263 one- and two-bedroom condominium residences, each with separate living and dining areas and two full baths. The condo units have private, furnished lanais with views of the Pacific Ocean, the West Maui Mountains, or the resort’s landscaped gardens. Fully equipped kitchens at Kaanapali Alii have refrigerators, microwaves, stoves, ovens, coffeemakers, dishwashers, cookware, and dinnerware. Other amenities include VCRs, washers and dryers, and in-room safes. You can also utilize the full service concierge services available to condominium owners. If you are interested in buying a luxury Kaanapali Alii condo on Maui, Hawaii or booking a reservation for a luxury Hawaiian vacation, please contact The Life of Luxury. Return to follow this popular luxury blog and read about the latest luxury real estate and travel news.